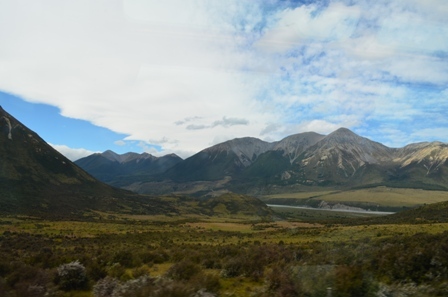 Every travel book I read mentioned how beautiful Arthur’s Pass is, and how the TranzAlpine train ride was one of the best in the world. 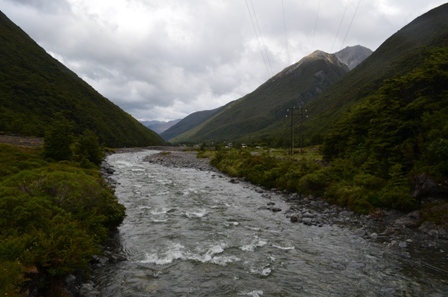 Arthur’s Pass is in the Southern Alps with the tiny village resting between the eastern and western sides of the Southern Alps. 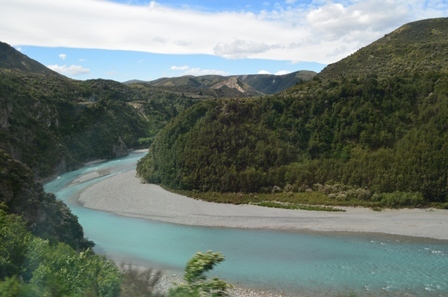 The train ride is approximately two hours from Christchurch and a gorgeous, slow journey across the Canterbury Plains, through beech forests, river gorges and up to the pass itself. 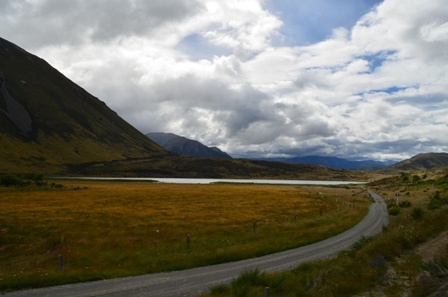 It’s certainly the most beautiful and relaxing way to get to Arthur’s Pass. I didn’t have my seat of choice for the train ride, since it was an aisle seat and a stranger was next to me, because the train was so full. However, this train had a very awesome viewing car. It was a normal train car, but there weren’t any windows so I had an open air view of the gorgeous scenery rolling past me. 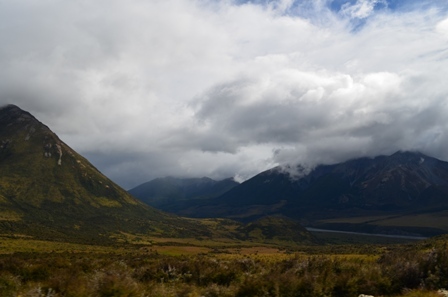 The weather was gorgeous on the way up to the pass, but once I reached Arthur’s Pass Village which resides at 737 meters (2418 feet) above sea level, the weather took a turn. 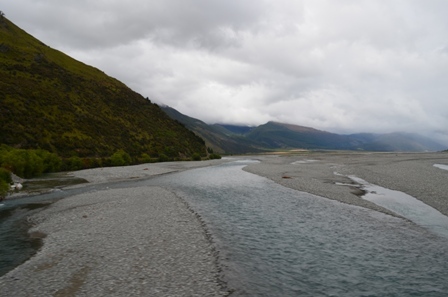 It was pretty typical weather for the area, that often creates weather that is cooler, rainier and windier than areas around Arthur’s Pass. It rains about half of the year, and many days it can pour many millimeters. In fact, even with all the rain on the first day, it was still less than the rain that fell a month prior. 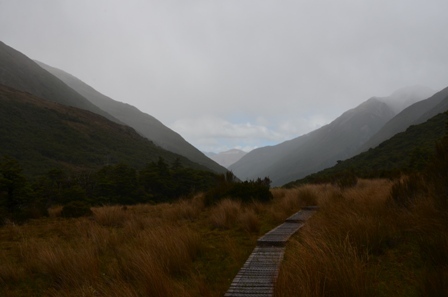 After lunch, the rain did slow down a bit, so I headed out with the intent on hiking the entire Arthur’s Pass Walking Track, which was 3.4 kilometers one way north of the village. 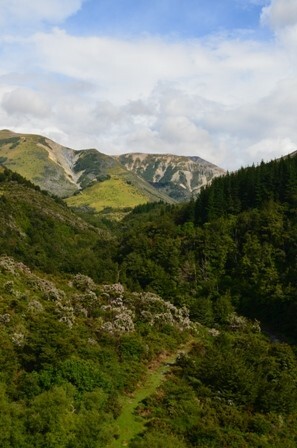 From the walking track are numerous side tracks that lead to other scenic viewpoints. My first side trip was on the Devil’s Punchbowl Walking Track. 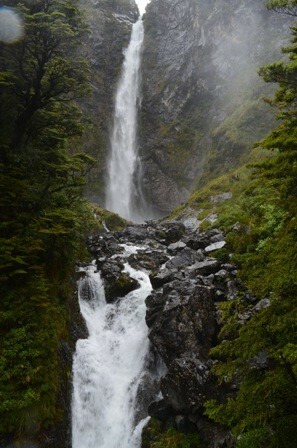 It was only a one kilometer track to the 131 meters waterfall. 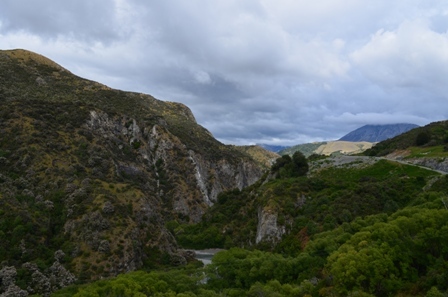 I could see the waterfall from the turnoff from the main track on the bridge over Devil’s Punchbowl Creek. Most of the track consists of a series of steps that climb 150 meters up to a viewing platform where I could view the base of the waterfall. 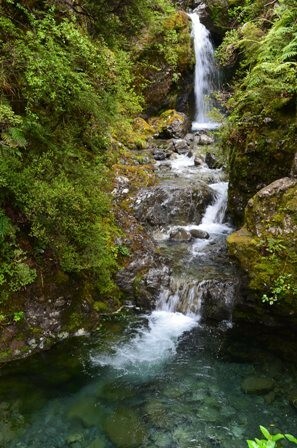 After returning from the waterfall, I walked a bit farther north to the Bridal Veil Falls lookout and more of the trail. It started to rain again, so I elected to turn around and walk back to the village with the intention of finishing the hike the next day. The next morning I headed out for some more hiking. 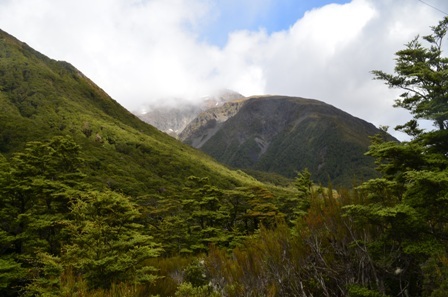 My original intent before I got to Arthur’s Pass was to climb to the bush line of Avalanche Peak via the Scott’s Trail, but I could not find the trailhead even with a map, and the weather wasn’t THAT great, so I decided to walk the rest of the Arthur’s Pass walking trail. Thankfully the weather today was clear and as sunny as this area typically gets. After the trail crossed the main highway, it broke off on a side trail called the Bealey Valley Track. The entire side trail was 1.2 kilometers and was quite scenic. I first reached Bealey Chasm, which was only a five minute walk from the trail turnoff. The bridge across the chasm is over a channel of rapidly running water cascading over huge boulders. The path continued, climbing a hill and emerging into a snowgrass clearing with very beautiful views of Mt. Rolleston/Kaimatau. 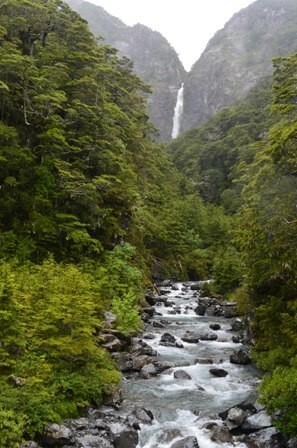 The trail reentered a beech forest for a short stretch to Bealey River. The trail ended here, and it is a great place for a rest stop or lunch break to admire the scenery around you. After backtracking to the main trail, it was a short walk up to the Dobson Nature Walk. The trail ascended a bit through a series of switchbacks, and there were many sign points describing the alpine plants and the history of the pass. 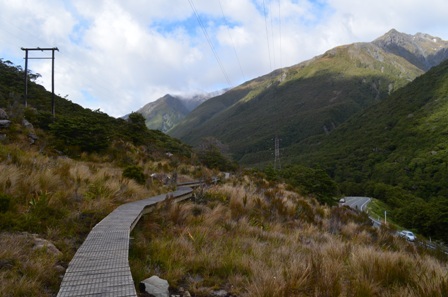 The trail then turned into the Lake Misery Track, which is a one kilometer stretch connecting the Dobson Nature Walk to the Otira Valley Track. The trail was actually through Lake Misery when the water level is low. Part of the track was boardwalked, but other parts were through narrow trails of tall grass and mud. Once the mud became too much of a nuisance for me to deal with, I turned around and returned to the village. After a leisurely lunch, it was time for the return train trip. This time I was able to snag a window seat on the most scenic side of the train car. 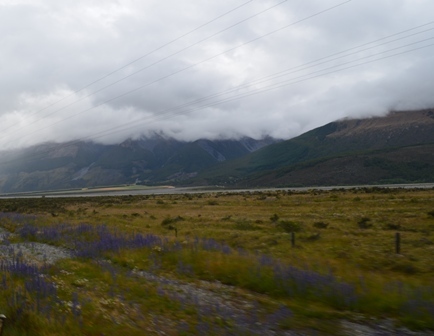 In all honesty, if I had known what the weather situation was going to be in advance, I might have just elected to do Arthur’s Pass in a day trip. 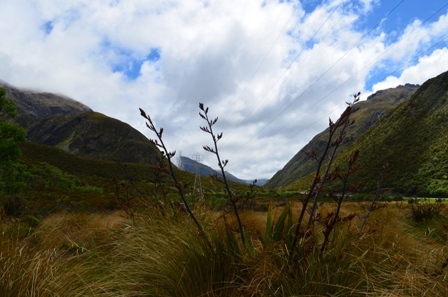 If you don’t want to hike Avalanche Peak or any of the other long tracks, you can easily see the main sights of Arthur’s Pass in a day. 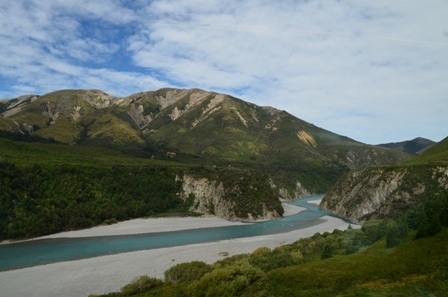 There are five hours between the morning train arrival at Arthur’s Pass and the afternoon return train to Christchurch. 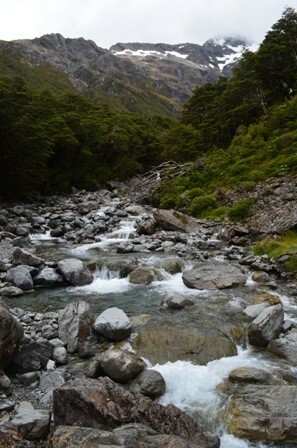 That is enough time to walk the entire Arthur’s Pass trail up and back, and enjoy all the side trips, and still make it back for lunch. 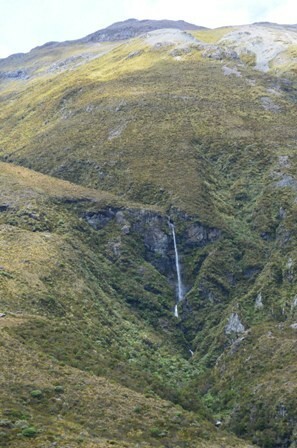 But if you can swing it, I definitely recommend at least a full day’s trip to Arthur Pass. 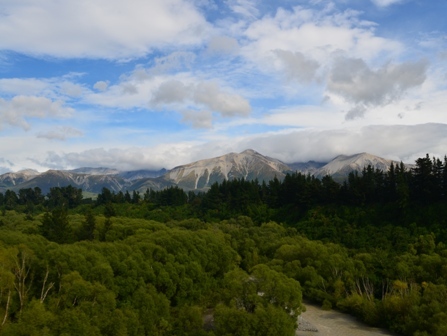 Between the gorgeous train ride and the gorgeous scenery of Arthur’s Pass village and the walking track, the alpine setting is worth your time.